BEARINGS There are no sleeve bearings in our entire line of general purpose motors. We use nothing but premium quality SKF brand ball bearings on both the DE (drive end) and the ODE (opposite drive end). It is exactly for this reason that we can mount our motors in the "shaft up" or "shaft down" position with no derating. 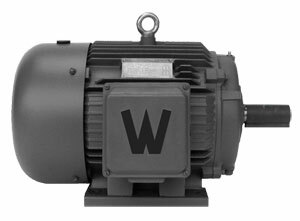 And all of our AC motors have a high tensile strength steel shaft. SEALS Our motors are protected from moisture and contaminants by the use of V-ring shaft seals on both the drive-end and the opposite drive-end. These motors are name plated IP54 Enclosure. CASTINGS Our motors are unicast construction, meaning the entire frame is cast iron in one piece, as opposed to two-piece castings that are welded in the middle of the main frame or at the point where the feet are attached to the frame. This unfortunate, cost cutting practice is becoming more prevalent in our industry. METALLURGY Our motors use only high density, FC200 cast iron frames on all sizes starting at 1 HP. This assures rapid heat transfer from the core of the motor into the motor's fins from which point it is dissipated by the motor's fan. Only a select few use this high density iron which results in longer insulation and bearing life. Many competitors use less expensive FC150 or even FC100 iron. MOUNTING FEET Our motors use full body length, solid mounting feet. These feet are cast into the frame of the motor. Many competitors have little tab-like feet that stick out like a dog's paw with holes in them. Our body-length feet handle the vibration better and provide better overall strength. FAN COVERS A unique fan and fan cover design forces the air through the valleys between the extra thick, extra deep cooling ribs. This provides much better cooling than the typical fan design that blows air off the end bell and out into space. Steel fan covers are provided as standard. JUNCTION BOXES Our large, easy-to-wire junction boxes are cast iron and have rubber dust curtains designed to keep foreign particles from entry. These covers are designed to come apart at an angle to permit ease of wiring. Most motors are convertible F1 to F2 and all are rotatable at 90 degree intervals. Conduit holes are provided per NPT standards. CERTIFICATION Our motors are CCSAUS Certified. Note the US stamp. It means that our motor has not only passed the Canadian Standard Association requirements, but also the USA's UL and ANSI standards, thus giving them the highest certification standards you can have for North America. Our certifications also include CE, CC006A, and of course ISO9001.